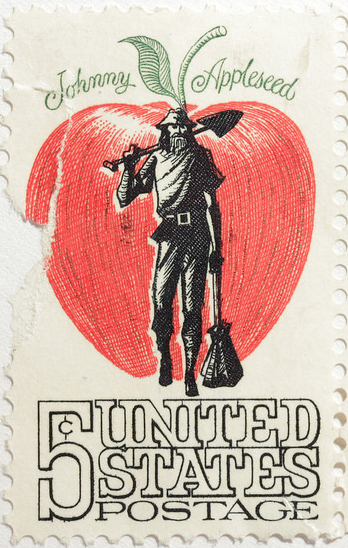 Johnny Appleseed U.S. postage stamp; photo by Ben Hutchison on Flickr (noncommercial use permitted with attribution / share alike). Johnny Appleseed is a folk legend that originates with the life of John Chapman (1774 -1845), an American pioneer born in Leominster, Massachusetts. The story is that Johnny Appleseed became a folk hero by scattering apple seeds from New England to the Ohio River Valley. John Chapman was given the nickname of "Johnny Appleseed," but he planted orchards by trade and did not actually wander as a homeless person planting apple seeds randomly. 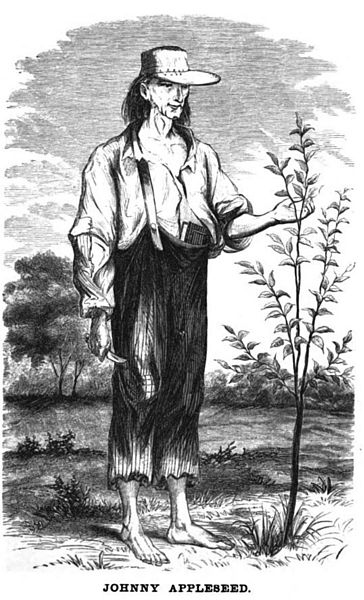 1862 drawing of Jonathan Chapman (Johnny Appleseed); public domain image on Wikipedia.